Charlottetown is the capital and the largest city of the Canadian province of Prince Edward Island. 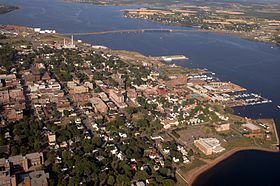 The population of Charlottetown was 34,562 in 2011. The mayor of Charlottetown is Clifford J. Lee. The French were the first European settlers in the area and they founded a settlement in 1720 named Port La Joye. British forces built Fort Amherst near the site of the abandoned Port La Joye settlement after they took control of the settlement and the rest of the island during the height of the French and Indian War. The town is named after Charlotte of Mecklenburg-Strelitz, queen consort of the United Kingdom. ↑ "Focus on Geography Series, 2011 Census – Census agglomeration of Charlottetown, Prince Edward Island". Statistics Canada. Retrieved 2012-12-12. Wikimedia Commons has media related to Charlottetown. This page was last changed on 9 November 2018, at 11:40.